We will only collect personal data where it is necessary for us to do so and where it is relevant to our communication with you. By filling out our contact form, you agree to the collection and use of information in accordance with this Policy. Alphabet School & Camps offer private and group English lessons in Rome and Milan and run residential, international summer schools for children ages 6-17 in the summer months. 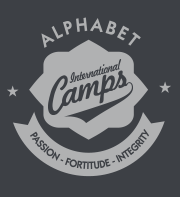 Alphabet International Camps is the A2Z s.r.l. registered in Italy. Our registration number is P.I.09184851005. We collect information from you such as your name, email, phone number, city andcountry of residence, and your child’s name and age to answer general enquiries. Bycollecting this information, we can more accurately and efficiently reply to your inquiries. We collect more detailed information about you when you book a course or a summer camp for yourself or your child (address, date of birth of child, etc.). We collect information when you make a payment through our payment system. We collect information from you if you apply for a job with Alphabet School and Camps. The information we collect is for legal, contractual or consent purposes. We do not need any sensitive personal information (e.g., racial or ethnic origin, political stances, religion, sexual orientation, trade union membership). Upon booking an overnight camp, in order to ensure we are able to provide a safe environment for your child, we may require health or medical information. In order to ensure the safety and wellbeing of our campers, staff applicants are subject to criminal record searches. All applicants will be informed before the search is conducted. Searches will be conducted upon a formal job offer from Alphabet School and Camps. On our website and in our promotional printed materials we occasionally publish testimonials from students and parents. We will always obtain your consent before posting or printing your testimonials. We will not include your last name on the testimonial. On our websites, online blog, Facebook, Instagram, Twitter, and YouTube accounts, password-protected photo gallery (accessed only by Administration team members at the School) and promotional printed materials we publish photos and videos of children who attend our courses and camps. Before publishing any photos or videos, we obtainexpress consent from parents in the mandatory “Modulo di Iscrizione” (RegistrationForm). Parents are given clear options with details of consent. They are free to deny consent if so desired. We collect your information through our website via our enquiry form, ‘Contact Us’form, booking form, application form, and inquiry form. Additionally, we collect your information via email enquiries and telephone calls to the School. We also collect information through the Agents who promote our courses. No method of transmission over the Internet, or method of electronic storage, is 100% secure. Therefore, while we strive to use commercially acceptable means to protect your personal information, we cannot guarantee its absolute security. Your information is collected in order for us to tailor our communications to be relevant to you and to fit your needs. We collect your personal information so that we can communicate with you effectively, respond to your inquiries, and keep you informed about updates and offers at Alphabet School and Camps. We do not collect any unnecessary information from you (ethnic origins, political opinions, sexual orientation, etc.). MarketingPlease note, you are able to unsubscribe from all Alphabet School and Camps communication at any moment by simply clicking Unsubscribe found at the bottom of all informative or promotional emails send by the school. In order to provide our services, we may need to share personal information with staff, host schools, official agencies connected with our work, parties involved in processing online payments and professional advisors such as our accountants. We will share such information on a limited, need-to-know basis. We reserve the right to disclose your personally identifiable information as required by law or to comply with a judicial proceeding or legal process. Alphabet School and Camps will not share personal information with third parties other than for the purposes described above except with the express permission of the data subject. We will not sell, rent or trade your personal information.